I wonder why, some of us, are so focused on our homes? 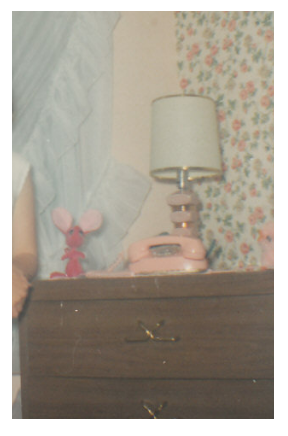 I watched my mom, decorate and paint and move furniture around, all the time. Then I started, moving my bedroom around, and placing posters on the wall. Mom let me, paint my furniture and then after a few years, I covered it all in wood-grained contact paper. I used to love to go through the Sears Catalog and decorate - and I would also draw plans of different types of houses. I did this all the time and actually wanted to be a Architect but was told, I could never do it, because I was not good in Math. So instead of trying, I didn't try at all. I have to wonder, if I was a young person today who had been encouraged to at least TRY, would I have accomplished that dream? Who knows and who cares, at this point. There was a time in our life, when we lived in our 34 foot motor home - downsizing. I loved it. But what started to get to me, was it was already decorated and there was only so much I could do. When we moved in to this house - (our last home) it had belonged to my Mom and Dad. I bought out my sister. For quite a while, it had my parents "style". I guess for awhile, it comforted me. Then I got lazy (depressed) and my adult children moved back home and I was NOT about to redecorate, while they were here. I didn't want to make it THAT comfortable for them. Plus, lets face it - they didn't take care of the house, like we wanted. So new sofas and carpets, were just going to have to wait. That is where we are now. They've all been out for a year and we are playing "catch up." It's like we have opened Pandora's Box - we keep wanting to do more and more. The good thing, is we are both frugal- and I am downright CHEAP. I love to try and re-use something FIRST before I will go out and buy new. Of course, you can't do that, with a new roof, windows, carpet etc. Yeah, we've spent a lot of money this year - we took out an equity loan for things having to do with IMPROVEMENT of the house. My husband retires in 6 years. Our adult children are now on their own. Sometimes, I want to get a fun part-time job. Haven't found one yet, because I am working on our home - to make it more organized and comfortable for us, in our old age. I was in high school when I first heard, Crosby, Stills, Nash and Young sing, OUR HOUSE. Immediately I was drawn to the lyrics- they sang about the house I wanted one day- a cozy room, two cats in the yard (I had five) and windows that are illuminated - that would be My House, one day. This will mark year 45 in my home. It is the first home I have owned. Probably will be my last unless something I really like comes along. It suits me and I am planning to do a post about it. I think this is called 'nesting'. Wow, thats nice. The longest I have lived in a home was 22 years. Having a comfortable place to call home, is very important for me. I know about living in a RV - We did it for 4 years. Had a blast. We sold ours last year. I'd never have carpet again, in a motorhome.